Southeastern part of the Marina district viewed from Marina Park. The Marina district is a neighborhood in the southwest section of Downtown San Diego, California along the San Diego Bay. View of west end of Market St., viewed from the 14th floor of Renaissance condominiums, which is located at First and Market. 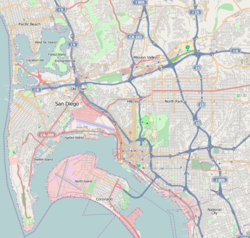 The district is bordered to the north by the Columbia district, bordered to east/south-east by the Gaslamp Quarter, and is bordered to the south-west by the San Diego Marina. This district used to be full of warehouses and vacant lots, but now it houses mid-rise and high-rise hotels, apartments, condominiums, medical offices and retail. Seaport Village and the San Diego Convention Center are located in this neighborhood. Pantoja Park, the oldest park in San Diego, is located in the Marina District. ^ Neighborhood Map Archived 2007-10-09 at the Wayback Machine. Centre City Development Corporation. Retrieved on 2007-09-18.